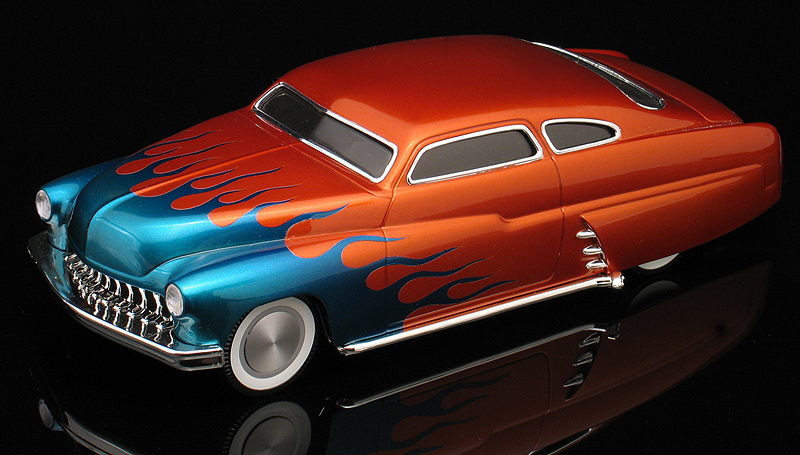 While shopping in K-B toy store one day I happened to come across a '50 custom Mercury lead sled 1/25 scale die-cast car made by Hot Wheels. The car was painted up like a police car and was part of their "Cop Rods" series. They were being sold at a close out price of just $5.99. 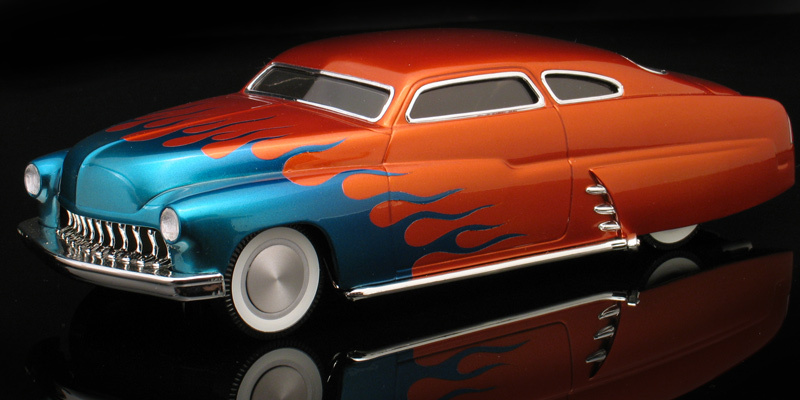 I bought a couple because I was impressed with the custom Merc's proportions and all the '50's style custom details like the chopped top, fender skirts, lake pipes, custom grill, etc., I thought it would make a pretty good looking shelf model, (sans the unusual police car markings) and with a decent paint job and a little detailing. After dissembling the Mercury, I sand blasted the die-cast body to remove the original paint and police graphics. Then I laid on my own custom blended paint job. Red, yellow, and orange dies were mixed with a PPG Deltron pearl white base to create the wild copper colored flip-flop candy paint job. 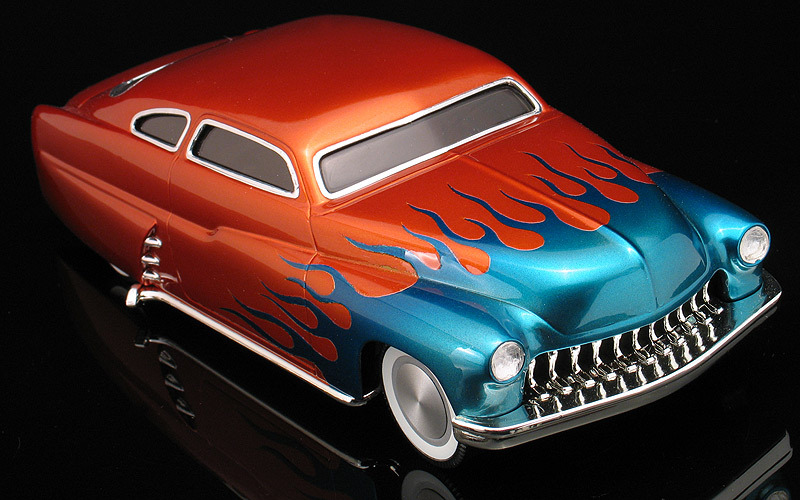 The flames blend from a custom mixed shade of candy turquoise to dark candy blue. Next, the whole car was shot with PPG concept 2000 clear with pearlescence powders mixed into it. I thought it turned out pretty decent for my first flame job. Because of the color and the fact that it started out as a cop car, I named my Merc, "Copper Fire." Other detailing includes headlights that were drilled out and replaced with better detailed plastic ones from may kit box. The die-cast toy came with a set of cheap looking toy wheels, so I replaced them with a set of "Parts by Parks" real spun aluminum moon disks. This was a quick and fun project that turned out really cool, so I went built another Merc, called "Strawberry Dream." Click here to read all about that one.